Volocopter - Manned electric multi-rotor VTOL vehicle. These are not intended to be extensive or inclusive; just a subjective selection of pages about new technologies and scientific topics that I think are neat. TechFuture: Hold On! Paul Moller's Skycar Is Coming - Bill_Robinson/Huffington Post - May.27.14 - Lengthy article about the Moller and the Skycar history and status. Neurea (M200) - in 2007 Moller initiated plans to commercialize this small ground effect vehicle, which he first demonstrated back in 1989. The new version, M200G, will use the Freedom Motors Rotopower engines, invented by Moller. part 2 - Saucer Flight Characteristics - Moonandback. carry several hundred kilograms, makes a test flight Nov.3.2016. Gino Gizio - multiple VTOL rotor projects including PAV (Personal Air Vehicle), DDRH hybrid helicopter, and the EJ110 ElectroJet. Joby Aviation - Multi-roter style aircraft. Most rotors used on vertical takeoff, then turned off and rotated and folded for horizontal flight. Lilium Aviation - Multi-rotors embedded into wing, which rotates for VTOL and for horizontal flight. Volocopter - manned multi-rotor electric VTOL vehicle. TF-X™ - will take-off and land vertically and still be drivable on roads. Sikorsky X2 rotorcraft - pusher rotor for horizontal flight and dual counter-rotating rotors for hovering. CarterCopter FAQ - What are the mu ratio and the mu-1 barrier? Thunderbolt Aerosystems - "Jetpacks, Rocketbelts, and Flying Platform Manufacturer"
BiPod - Scaled Composites - hybrid powered roadable airplane. Burt Rutan's last project before he retired from Scaled. DARPA Transformer - this program seeks to develop vehicles for the military that can switch from driving to a vertical-takeoff-and-landing flying mode. logi Aerospace - Tyrannos: "first roadable 4-person air vehicle that anyone can literally drive into the air". The vehicle will use the firm's improved ducted fan design and lightweight carbon fiber composite structures. Maverick Sport - ITEC - a rugged, roadable and off-roadable car that converts quickly to and from flying mode with a boom deployed parasail. "One Car - 360 Degree Transportation - Concept Car, Boat, Plane, Helicopter"
Terrafugia - developed by group of MIT students, including Carl Dietrich who won the prestigious $30,000 Lemelson-MIT Student Prize for his design concepts. The Coming Air Age by Igor Sikorsky - The Atlantic - September 1942 - Sikorsky's predictions of personal flying cars by the 1960's. D-Dalus - An innovative system that "uses four, mechanically-linked, contra-rotating cylindrical turbines, each running at the same 2200 rpm, for its propulsion". D Dalus Video - YouTube - "Servus TV program broadcast on 27 July 2012 showing the first sucessful Test Flight of the D-Dalus Cyclogyrocopter at the test facility in Austria"
D-Dalus (IAT21) - an entirely new genre of aircraft arrives - YouTube - a video from the IAT21 booth at the Paris Air Show in June 2011. A display video of the D-Dalus can be seen in the background. Lockheed P791 Hybrid Air Vehicle - nextbigfuture.com - Jan.6.10. QinetiQ 1 - experimental manned balloon to go 130,000 ft high. Envelope Expands in Electric Aircraft Flight Tests - AirVenture/Oshkosh - includes video of the test flight. Jets of the Future - Portfolio.com - Sept.2007 - offers a nice multimedia comparison of the different VLJs on or coming to the market. Southeast SATSLab - consortium to develop new air traffic control systems to deal efficiently with large numbers of general aviation vehicles. Hummingbird Aerobatic Aircraft Design "The World's Most Maneuverable Aircraft"
Airparks/Airport Community - housing developments centered around a small airport. Most of the residents own a plane that they fly. What is an Airport Community? Spruce Creek Fly-In Community - example of the more than 2000 US communities centered around a runway that's used by the inhabitants as routinely as driving a car on the road. Parajet Ltd - "Paramotors from leading paramotor manufacturer"
High Altitude Glider Project - project by Art Vanden Berg involving a "small, self-guided glider, designed to fly at very high altitudes. The glider is carried up by its tail with a helium weather balloon to altitudes of up to 85,000 feet above sea level, and then released to fly back to the launch point." yet2.com - TechPak - "new, small jet engine is suitable for light-sport, ultralight, and experimental aircraft, and can replace the vibrating piston engine and propeller combination as used in most sport aircraft with smooth jet power for the 21st century." Jet Engines, Microjet Engineering Ltd. Gas turbine engines. Microturbines. Turbojet. Turbo Shaft, Prop, Fan. 15 to 650 lbs thrust. Engine invention jet. Jet propulsion engine. Micro turbines, small gas turbines and micro turboprop for model airplanes - Radio controlled Aircraft. Ramjet Primer - basics of ramjet propulsion by Glen Olson. Zach's Projects - pulse jets, turbojets, etc. 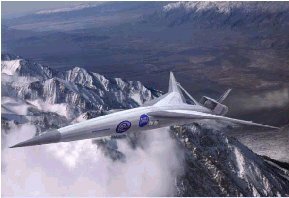 Howstuffworks "How Flying Wings Will Work"
supersonic aircraft. Developed for a DARPA funded study. Buck Rogers, Watch Out! - Science@NASA - March.01.01 - self-healing materials, flapping wings and more. Best Aviation - "Aviation Jobs and Employment Opportunities"
Day in the Life of air traffic over the United States - video - amazing video showing the flow of airliners over the US. AirSafe.com - "Airline Accident and Airline Safety and Security Information for Passengers and Aviation Professionals"
Stormbirds: Me 262 Project - develop and fly highly accurate replicas of the German jet fighters. More Cool Tech: 3D Displays, Robotics, etc.